I don’t specifically remember reading aloud to her while I was pregnant (though I think that is a good idea), but I did begin reading to her before she could sit up. She loved rhythmic stories such as Hand, Hand, Fingers, Thumb. If I have occasion to read it these days, I still read it in the same cadence she loved, keeping a steady beat with no pauses, even between the pages. 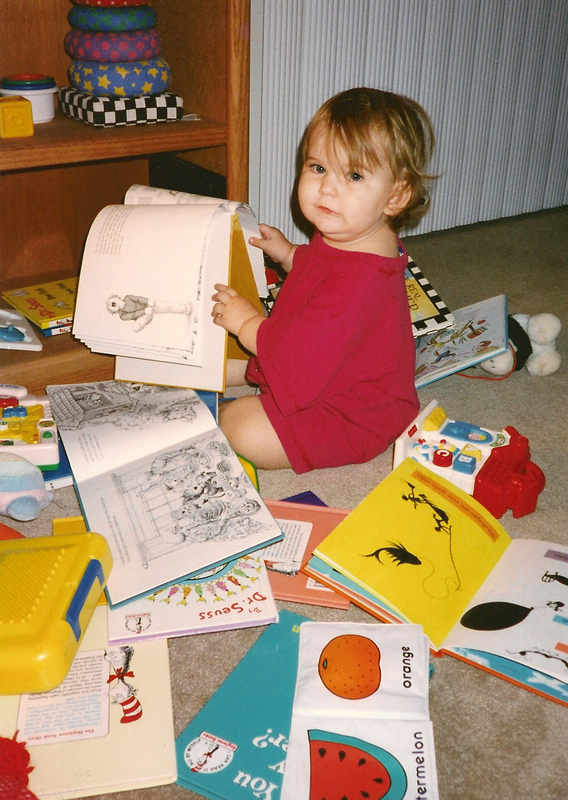 Books were her first, best toys. As a toddler, she used to sit on the floor in front of her bookshelf, put her forefinger on the top of the spine of a book, and pull firmly until it came off the shelf, repeating until she had all her friends on the floor with her. After she nearly put her eye out a time or two by flipping sharp corners directly toward her face, I transferred her books into baskets so she could make her messes with less threat of injury. 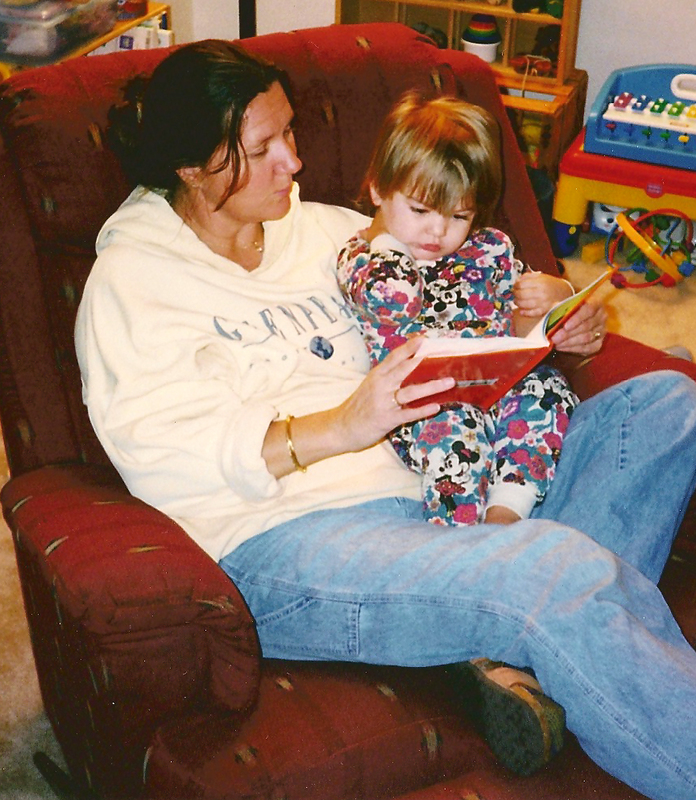 When she was old enough to hold the books and turn the pages herself, I would “read” to her while I was driving. We kept a basket of board books in the car, and I would recite each page (I had them all memorized by this point) and say “Ding!” when it was time for her to turn the page. Sometime around eighteen months, when she was barely talking, she began saying a phrase I couldn’t figure out. She would walk around saying “ah goo, ah goo, ah goo” and I could tell it had meaning to her, but I couldn’t quite figure out what she meant by it. Then one day I saw her plop down with our well-read copy of Where the Wild Things Are, carefully turning each page, until she came to the page where “that very night in Max’s room a forest grew … and grew … and grew …” and as she turned each page she recited, “ah goo … ah goo … ah goo …” and I knew she was reading. She would bring a book to anyone sitting still. This is my midwife, shortly after the birth of baby #2, being coerced into reading with Noa. No, of course she was not decoding the phonics of the written words, but she was getting meaning from the book and understanding the story on her own, which is after all, at its heart, what reading is. Around her third birthday, we had to send a birthday card to a family member. I handed her the card and a pen for her to “sign her name” … that is, make a scribble. She took the pen from me and carefully wrote each letter of her name. I had never shown her how to write her name or even talked with her much about the alphabet other than in the most general terms, and of course reading books such as Dr. Seuss’s ABC and Applebet, one of my all-time favorite alphabet books. I am not a proponent of programs to teach very young children to read, but it was clear to me that she was going to be one of those kids who just picks it up early and effortlessly. Her headlong progress stalled out, however. I fully expected her to be reading independently somewhere between four and five – again, without me pushing, pressuring, or even teaching her to read, just because she was “that kind of kid.” But though she progressed almost magically on her own to the point of reading simple words or phrases, if I showed her a page with more than two or three words on it, she would physically turn her head away, stating, “It’s too hard.” Please understand, I wasn’t trying to get her to read books other than the simple picture books she loved, or even pushing her to read in any way; I was following her natural progression until she suddenly stopped for no reason I could discern. We already knew that she had vision problems. Around her second birthday, she began crossing her eyes. An exam with a regular eye doctor put her into glasses to correct her severe hyperopia (far-sightedness) and also mild astigmatism. When she wore her glasses (which she did at all times) her eyes didn’t cross, but as soon as they were off her eyes would cross again. Her exam revealed that she was not using her binocular vision; that is, her eyes did not work in sync, but one at a time. Look at a page of print and try to read it while alternating using your eyes: close first one eye then the other and repeat that in succession, and you’ll see why more than three words on a page was “too hard” for my daughter. Her glasses stayed, of course, as her vision was so poor, but our new eye doctor did remove the correction for astigmatism from her prescription. He said she did have astigmatism, but when she focused on something, her eyes corrected it on their own so she didn’t need the correction in her spectacles. 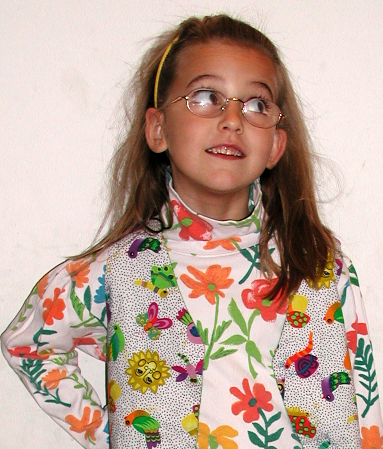 As I learned more about vision therapy and who needs it, I realized quite a few things about my daughter that had seemed like idiosyncrasies were, in fact, symptomatic of her vision problem. For instance, when I gave her stickers and paper, she would pile all the stickers almost on top of each other in a little square, leaving the rest of the paper completely empty: she hyperfocused on a small area that she could see easily, rather than looking at the entire paper. She ran almost sideways, looking over one shoulder. She had never crawled as a baby. Vision therapy (which I will post about more soon) brought rapid changes in more than her reading ability, which blossomed within two or three months of beginning the therapy (though reading was not part of the therapy). She began to run in a straight line. In gym class (her fine motor skills were excellent but she lacked most of the graces having to do with large muscle skills, so I enrolled her in a fun, low-pressure gymnastics class around age four) she had always been bottom of the class, but the summer of her vision therapy, every coach in the class came up to me to mention her sudden and (to them) inexplicable improvement. She was in vision therapy for about nine months and came out of it reading fluently and running straight. She no longer crosses her eyes when her glasses are off … or at least, only when she wants to. And that’s really all I have to say about how Noa learned to read, because that’s all there is. I read to her extensively, I surrounded her with books, I taught her to love books. When she hit a snag in her development, I found the help she needed to get past it and get on with her reading. As soon as her vision was straightened out, she began reading without any further instruction or encouragement from me; she was already desperate to read and had the entire skill set necessary for it, she just needed working vision to implement it. She skipped over a lot of the early childhood literature, moving quickly on from the simple first chapter books to complicated books well above her grade level. I will add this note of caution: read to your children, let them see you loving books, but don’t necessarily expect this type of response. This is Noa’s personality and how she responded to books. In the next chapter of this series, you’ll read about her mirror opposite in the learning-to-read department: her brother Lock, who received the same amount of “book stimulation” she did, but responded very differently. Some of my favorite children’s books. Teach a Child to Read With Children’s Books by Mark Thogmartin: This is the only teaching reading book I recommend for homeschoolers. It takes the natural learning to read process as shown by my daughter and describes the process in a way many parents will find helpful, especially if they are not avid readers themselves. It also gives ways to encourage and enhance reading while keeping it meaningful and enjoyable. Very interesting story! What’s more, the promise of three more different stories of how your other children learned to read is something really to look forward to. I have a feeling you’re going to put a lot of minds at ease when they see their child in one of yours. Well they are four very different stories, so I hope it will encourage a lot of people! I can’t wait to hear more about the vision therapy. I want to get all four reading stories written first, but I won’t forget to get back to the vision therapy!